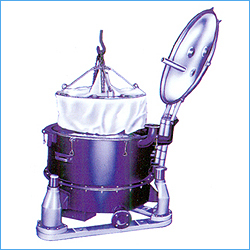 Our clients can avail from us Lifting Bag Type Centrifuge that is available in various models and capacities. These products are widely demanded by various industries like chemical, food, petrochemical, pharmaceutical and textile. 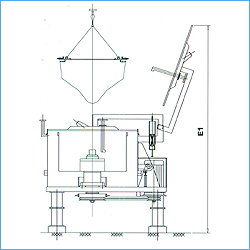 In addition to this, we are capable enough to customize this Lifting Bag Type Centrifuge as per the specifications detailed down by our prestigious customers. The latest trend in solid / liquid separation is to go in for greater ease in cake handling. Filter cloth is available in the desired strength and micron size. The fabric with poly- propylene, woven/ non woven polyester, nylon, cotton etc. with strengthening strips and hook up arrangement are easily available. 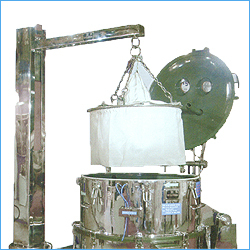 The ACE lifting bag system supports such filter bags. 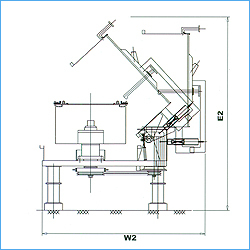 Quick and easy fixing arrangement helps in the centrifuging. 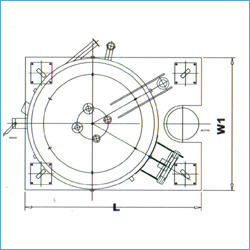 The time factor for the various operations is studied and this is passed on to the user at the time of installation and commissioning. The filter bag setting is precisely done so that the entire assembly is as fool-proof as the simple top discharge centrifuge. 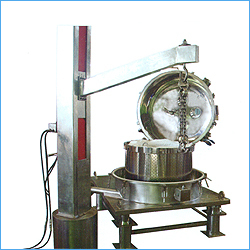 Hence 100% solid liquid separation without loss of a single solid particle in filtrate is achieved by the instant cake lifting type centrifuge. The head mom required for a particular lifting type machine is indicated in the table shown below. • The time required for cake removal is negligible. • Production is increased two-fold. • Manual contact with cake is avoided. • Cake can be easily elevated to upper storeys without the use of lifts or trolleys. • Cake spillage on the floor is nil. . More volumetric charge per machine available. 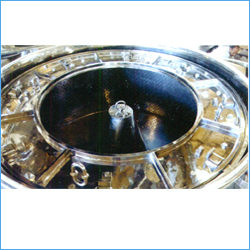 • Easy cleaning of the basket in and out. . Full opening of the lid helps maintenance.